So, there I am, walking out of a supermarket this morning, when I see a billboard across the road questioning my identity. I thought I heard the last of this a few months ago, after these billboards started appearing – a good explanation of what happened was given by Jon Kelly, writing for the BBC [www.bbc.co.uk/news/magazine-36499750]. 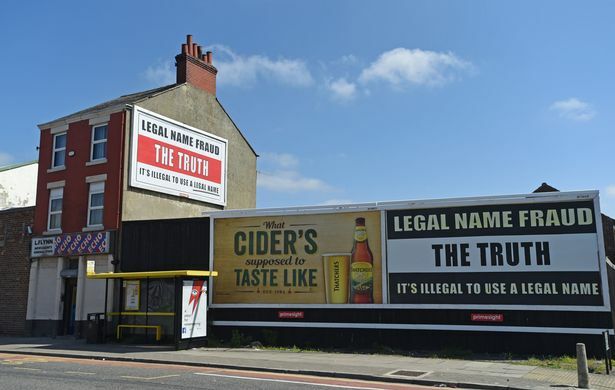 Because these billboards are not cheap – similarly-sized spaces from Primesight, owner of the site I saw, usually cost around £175 per week – so this unexplained string of words could just be a really efficient way for someone to piss away their own money, across the whole of the country. Anyway, I guess I now have to find out what it means. Searching “legal name fraud” online brings up a truly bizarre, and baseless, conspiracy theory about how your birth certificate means your name is copyrighted property of the nation state. This is a misunderstanding of how the layout of a birth certificate is Crown Copyright, but not the information contained on it, which is subject to the Data Protection Act, as you hope it would be. What is asserted is that using your own name means you are committing fraud, because it does not belong to you. 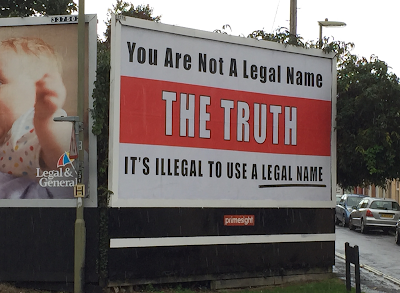 Anything you normally use to prove your identity, down to your passport or a utility bill, is using your Legal Name, and not your own. This is an interesting switcheroo, insisting it is YOU committing the fraud by using your own name, instead of the government, but going as far as insisting you can refuse the rules of law, or pay any debts you have, because you were somehow duped into being enslaved, is incredibly dangerous. Perhaps, if you are prepared to search for this stuff, then believe it, you deserve what is coming to you. I am confident about this because I have changed my own name – I used to be Lewis Spence, instead of Leigh, which is an entire story in itself. In making this change, I understood that having confidence in yourself as a person, and in the rights we all have, are what led to my new name being accepted quickly – there is no point in owning something unless it has been given meaning, and a name is just a name without the person attached to it. For this to work, it requires the consent of everyone, which I learned had to be earned – just telling people to change what they know cannot be expected overnight. Once you show what it means, there should be no problem.